It’s funny how infrequently we think about the actual meaning of words that we use. For example, “uncanny” — like most people, I’ve spent the majority of my life taking it to mean “strange”, “weird”, or “unsettling” – and it does mean that. But last year I learned that its more proper definition is “perceiving something as both familiar and alien at the same time, making it uncomfortably strange”. 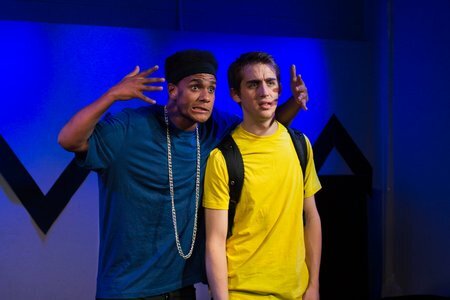 Dog Sees God: Confessions of a Teenage Blockhead, currently being performed by Echo Productions, takes the familiar characters of Charles M. Schulz’s iconic Peanuts comic strip (Charlie Brown, Sally, Linus, Lucy, etc. – although they’re never called by those names), and imagines how they’d grapple with the struggles of the modern high school experience. The effect is, as I suggest above, uncanny. It’s also surprisingly moving, and makes for a rewarding theatrical experience. The show starts when the main character (sneakily named CB) tragically loses his beloved dog to rabies. Heartbroken and unsure of how to cope, CB reaches out to anybody who’ll listen, trying to come to grips with his loss. What ensues is a journey of self-discovery that has far-reaching consequences for CB and his circle of friends. But the cast, directed by Victoria Fuller, did a beautiful job of making the script come to life, and even if I’d never had any exposure to Peanuts, I’d have been just as engaged in the story. Thomas Duplessie brought an effective combination of earnest curiosity and teenaged angst to CB, and never fell into a (forgive the word) cartoonish imitation of his character’s inspiration, Charlie Brown. Sheri Godda made me laugh way too loudly way too frequently as CB’s drama geek sister, and yet, when the show called for it, she brought a true gravity and grace to the stage. It’s clear that the performers understand their characters on a deep level, and are painfully aware where they fit into the high school food chain. That awareness is most clear in Tyler Hagemann’s performance as Beethoven, the ever piano-playing member of the group. The other kids bully Beethoven for being gay, and when he finally gives voice to his true feelings of desperation and hatred for his classmates, it’s gut wrenching. In the end, Dog Sees God is much more than a flimsy modernization of a familiar fictional franchise. It raises questions about a wide range of very real issues, including grieving, bullying, homophobia, the afterlife, and the culpability of bystanders. Two short notes: 1. The show uses strobe lighting, and I don’t think I saw any posted warnings about that before the show, so, be forewarned. 2. Dog Sees God is being staged in Echo Productions’ own performance space, aptly titled The Space. And that’s what it is – a performance space. You won’t have fancy seats, and you won’t be seeing fancy sets. But if you’re like me, you won’t care. Dog Sees God: Confessions of a Teenage Blockhead is a damn good show. And now I’m going to be depressed every time I see a Peanuts comic strip — although, if we’re being honest, it’s not like Charlie Brown was ever happy in the first place. Dog Sees God: Confessions of a Teenage Blockhead plays through November 15th at The Space, 250 Augusta. Wed-Sat 8 pm, Sun 2:30 pm. Tickets are available online by clicking here, by e-mailing tickets@echoproductions.ca or calling (647) 983-3246. Photo of Adrian Yearwood and Thomas Duplessie provided by the company.